Now that I'm not wasting my time prowling through Facebook any more I spend more time browsing through some of the web sites I have linked and I found a very interesting entry on the OC Political Blog site. That site, a communication portal that has replaced the old financially distressed Red County site, provides a "conservative" view of issues in our neck of the woods. The piece I refer to is titled, "Westminster Hiring Lobbyist to Revive 405 Freeway Fight", and may be found in total HERE. In that article the author - an unidentified writer using the pen name "OC Insider", tells us that last night - January 9th - the Westminster City Council was to consider paying lobbying firm Townsend Public Affairs $5,000 per month for six months to try to get the recent decision by the OCTA to use Alternative #1 on their plans to widen the I-405 beginning in Costa Mesa. "The City of Costa Mesa has asked the cities of Westminster, Fountain Valley, Los Alamitos and Seal Beach to volunteer to share in the cost for the professional services of Townsend Public Affairs to date in the amount of $5,000 each. 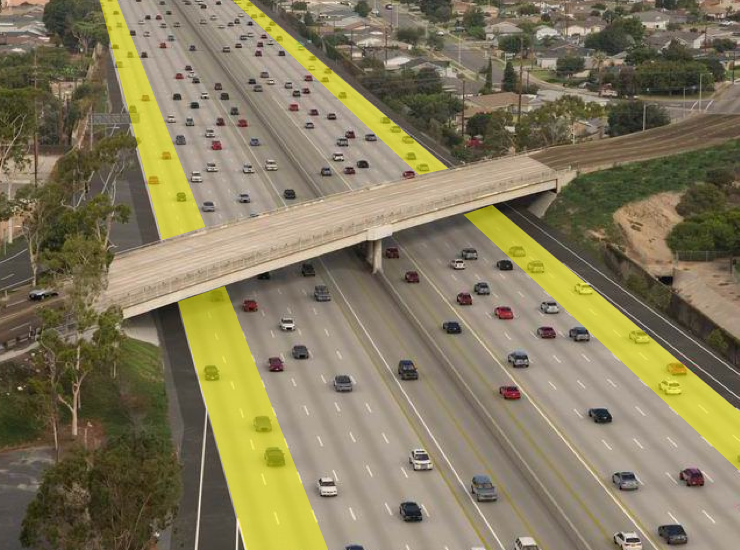 The City of Costa Mesa has also informed the corridor cities coalition that they have retained Townsend Public Affairs for future services related to the I-405 Improvement Project. 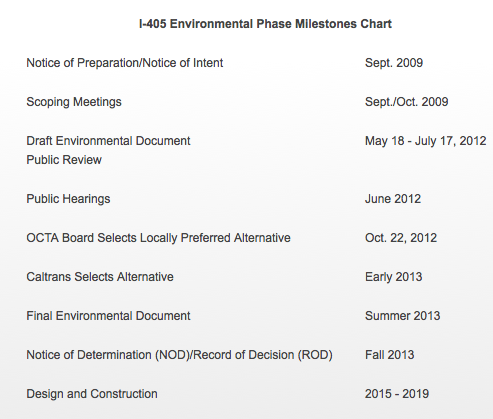 The work includes the following objectives: prevent the reconsideration, adoption and implementation of Alternative 3; stop the implementation of Alternative 1; and promote the adoption and implementation of Alternative 2 as the locally preferred alternative for the I-405 Improvement Project. The future services are expected to be completed in approximately six months, or when Caltrans adopts the locally preferred alternative. At that time, the City of Costa Mesa will ask the cities of Westminster, Fountain Valley, Los Alamitos and Seal Beach to volunteer to share in the cost for these services for an amount not to exceed $5,000 each." I contacted the City of Westminster and was told that the issue in question, which appeared on their Consent Calendar Tuesday night, authorized Westminster to pay the City of Costa Mesa $5,000 and was approved by the city council unanimously. It looks like we have already jumped off this cliff by apparently retaining Townsend Public Affairs, HERE, and are now trying to find someone to throw us a financial aid parachute before we hit the ground. It's apparent that some of the cities in question have not yet signed on to help defray the costs. I find myself wondering if we're going to be on the hook for all of the Townsend costs next summer. By the way, in case that name sounds familiar, Townsend has been in the news this week because Tuesday the new Irvine City Council, in their haste to take control of the Great Park fiasco, apparently fired the firm from their lobbying efforts for the Great Park Board. ALREADY SHOWN AS "CURRENT CLIENTS"
I contacted Costa Mesa Communication Director Bill Lobdell on this issue earlier today. He confirmed that the City did, in fact, earlier retain Townsend Public Affairs to "assist with advocacy efforts" (lobbying) with the OCTA Board, the County Board of Supervisors and other corridor cities. He tells me that they are now considering renewing that contract so Townsend can do as indicated above. He did not mention any numbers. 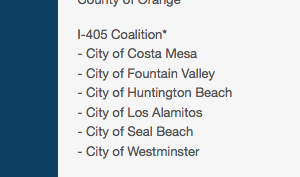 The Townsend web site identifies the cities in question - the "I-405 Coalition" are "current clients". Here's the image from that part of their web site. So, I called Townsend Public Affairs in Irvine to get the straight scoop. I spoke the President, Christopher Townsend, who confirmed that his firm had been retained by the coalition, above, but that he could not discuss the details and terms of that arrangement. In my view, this is a good thing for all of the cities involved. If Townsend is somehow successful in getting CalTrans to select Alternative 2, not 1 and certainly not 3, then these consulting dollars will be well-spent. NOTE: After I posted this entry, and despite the fact that other cities apparently believe the contrary and the consultant shows the coalition as current clients on their web page and the President of the company confirmed they were onboard, I was contacted by Bill Lobdell - twice - to inform me that THERE IS NO CURRENT AGREEMENT WITH TOWNSEND PUBLIC AFFAIRS to represent the City's interests in the I-405 issue at this time. The check issued above was for reimbursement for past services. This is an odd situation, but I'm going with the last word from Lobdell.